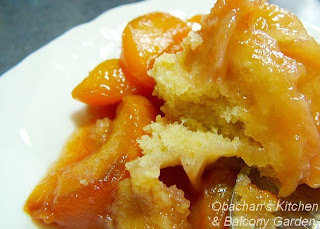 As I wrote a year ago, now making a nectarine cobbler is one of my summer rituals. I've already learned that here (and in some other prefectures as well) nectarines are available only for several weeks in summer and once they disappear from store shelves, they never come back until next summer. 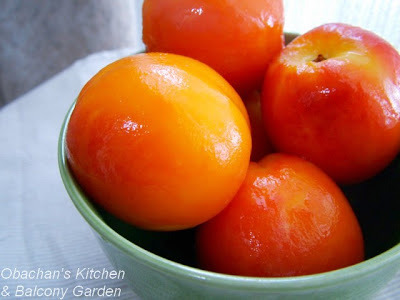 So this summer, I kept my eyes on the fruit section of several supermarkets -- not only one place --, waited until the end of our very short nectarine season and bought a pack containing the ones that seemed very ripe. Yep, no more "not-very-ripe-but-already-going-bad" fruit for my cobbler. 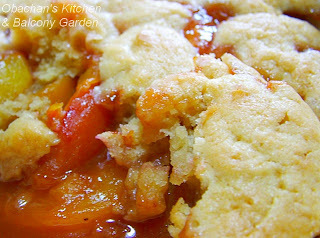 And I baked this nectarine cobbler on August 10th. I know. "Obachan the procrastinator," right? :D Forgive me. On the 11th and 12th, I was busy taking photos at our big dance festival (photos are here, if you are interested), and right after that I went to my parents' house. That's how I completely forgot to post about this cobbler. BTW I used the same recipe as previous years (but I use salted butter). Too bad I didn't have ice cream to eat with this cobbler when I took above photo. And when I did have ice cream, I didn't have time to shoot a photo because the ice cream melted so quickly. The cobbler looks perfect and you didn't have to brown the top a bit more. Biscuit-topped cobblers like the one you made are best when the tops are just golden. Just perfect nectarines! and I love cobblers! maybe I'll do them with our plums?! perfect with vanilla ice cream. By the way, your photos of the Kochi Dance Festival was great! I remember watching some people in Uwajima practice many years ago... great costumes and superb energy. Nectarines are my favorite fruit. Yum! Hi. I don't know where you live, but I agree. I think fruits taste best when they're in season. And thanks for taking a peek at my Yosakoi post. Yeah, I saw the team from Ehime (not sure if they were from Uwajima, though.) Now here in this prefecture, we are about to recover from the burnout. Aren't they good? Nectarines are rather new around here -- White peaches are a lot more popular in Japan. But our white peaches are no good for making cobblers, I think. I don't think I've seen nectarines in Osaka. :( guess I'll have to be more observant next summer. Your cobbler looks lovely. In the southeast USA, we have had a freeze back in April during bloom, then we have had a drought all summer (no rain at my house for 3 months), and we have no nectarines. I have to be satisfied with photos like yours. Looks delicious! You know what?! They must have read my post. Nectarines have come back on the shelf at one of the supermarkets in this area! So I guess there's a chance that you might find some in Osaka now.